This spaghetti and meatballs recipe is everything you’d expect from Dorie Greenspan. It’s easy, utterly delicious, and a crowd pleaser. The meatballs take on a unique taste and texture thanks to stealth ingredients oats and walnuts. 1. Pour the whole tomatoes into a large Dutch oven and use your hands or a pair of kitchen scissors to break them into bite-size pieces. 2. Add the remaining ingredients and stir to combine. Place the Dutch oven over very low heat, cover, and gently simmer while you make the meatballs. 3. In a large bowl, combine the beef, sausage, onion, oats, walnuts, herbs, and salt and pepper and mix gently by hand. Add the lightly beaten egg and work it in just until combined. Using a medium (1 1/2 tablespoon) cookie scoop or your hands, form the mixture into 24 to 28 small meatballs about 1 1/2 inches (4 cm) in diameter. Be careful not to compact the meat too much. 4. In a large skillet set over medium heat, warm the oil. Add half the meatballs and cook, turning as needed, until they’re browned on all sides, 4 to 5 minutes. (You just want to sear the outside of the meatballs; you’re not looking to cook them through.) Transfer the meatballs to a paper-towel lined plate and pat them lightly with additional paper towels to remove as much oil as possible. Repeat with the remaining meatballs, adding more oil to the skillet if needed. 7. Finish with cheese and herbs, if using, and get this to the table—it’s a dish that should reach the table steaming hot, looking like it’s sending out smoke signals. Dorie Greenspan's Spaghetti and Meatballs Recipe © 2018 Dorie Greenspan. Photo © 2018 Ellen Silverman. All rights reserved. All recipes and photos used with permission of the publisher. Wow! Dorie Greenspan's spaghetti and meatballs just moved to the top of our favorites list! The oats and walnuts added to the meatballs certainly do what the author intended for flavor and tender texture. Oats I can understand. But I never would have guessed about the magic of including walnuts in a meatball recipe. The flavor of the sauce with the added balsamic vinegar was incredible as well, and simmering the two together was simply amazing. When the pasta was done and drained, I removed the meatballs to a bowl and then added the pasta to the sauce in the pot to coat the spaghetti and then served the meatballs on top as I didn't want to risk them breaking up while tossing the pasta. To control the spiciness of the dish, I opted for the mild Italian sausage and added red pepper flakes to the sauce and this worked perfectly for us. I also threw in some chopped fresh basil to the sauce as it was simmering since I ended up with extra after chopping enough for the meatballs. I used a #40 medium size cookie scoop (3/4 oz) to make 28 meatballs. I used a Dutch oven to make the sauce and a large 10 inch nonstick skillet to sear the meatballs in 2 batches. I LOVED this spaghetti and meatballs dish. I intended to have it for dinner one night and then vacuum-sealed and froze portions so that we could enjoy it one or two more evenings at a later time. I enjoy having packages like this in the freezer so that a good home-cooked meal would be just a defrost away. Well, so much for making plans. I loved this so much the first night that I couldn’t wait to have it again the next night. I actually thought about it all day. And then I could have frozen what was leftover last night, but, that was not to be. Guess what we are having for dinner again tonight? And I must say that I am really looking forward to it. I do love meatballs and make them in myriad of styles, showcasing many different ingredients and many different cuisines. I cannot recall ever using walnuts or rolled oats in the past. The walnuts could be detected here and there, but I could not pinpoint the oats. I am sure that both added to the finish product and will eagerly make this again in the future. The hot Italian sausage could definitely be detected in the meatballs, and it also added a nice spice to the tomato sauce after the meatballs simmered in the sauce for an hour. The end result was a very tender, flavorful meatball. After simmering the meatballs in the sauce for an hour on a burner that was as low as would go, most of the sauce had been absorbed by the meatballs. There would not have been enough to go over spaghetti. I chose to make another batch of sauce the next day, so that I would have enough for comforting bowls of spaghetti and meatballs. I also cooked everything for that extra 30 minutes to meld all of the flavors. Everything worked out perfectly. One suggestion I have if this makes the site, is to mention somewhere, in large print, perhaps under the title of the recipe, is that there is 1 1/2 hours of inactive time. I am very famous for missing things like that. The reason that I was able to make another batch of sauce to add to the meatballs, was that I missed that sentence in the recipe, thinking that once the meatballs went into the sauce, I would simmer for a short time, and then we would eat dinner. My husband heard me laughing in the kitchen, and knowing me so very well, called out,” Does it have to cook overnight?” I know that I am not the only one who does this, so it might be helpful to have warning. Or, bold letters in the text? Perhaps underlining that sentence? I am now going to go into the kitchen and heat up what will be our final two bowls of this delicious dish. That is 6 helpings of meatballs and spaghetti altogether, and after that we will have 6 meatballs leftover to freeze. That’s pretty good for just 1 1/2 pounds of meat. BTW a glass of spicy Zinfandel was the perfect fit for this dish. First of all, this sauce is so very simple and quick to make and it is delicious! I believe San Marzano tomatoes are much of the reason it's so good, but agree that the secret dash of balsamic could help. Using a handful of ingredients and voila! A great red sauce that I made in a 10-inch saucepan. The only thing I would do differently is double the recipe. I needed more sauce for 6 servings with pasta. The onion was nice and mellow and saved me time not sauteeing it before adding it to the sauce. I missed having Parmesan in the meatballs for the flavor and tenderness it adds. I also would've like to have a little more oats to make the meatballs a touch softer. They were still very good but my rating is higher for the sauce. This spaghetti and meatballs was a joy to cook and packed with flavor. The dish was enough for 4 generous servings that left you feeling satisfied. The sauce was simple to prepare but I personally would have opted for the addition of some herbs, such as oregano, as well. The meatballs were incredibly flavorful and moist. They held their shape beautifully during frying and when cooing in the sauce. This recipe is definitely a keeper. Little effort that delivers fantastic results. This gets high marks for being an easy to prepare people-pleasing recipe. I'm not the best at making meatballs, but that only served to spark dinner table conversation. I liked the bite of the hot sausage in the meatballs--not so strong it would scare people away but not so bland it tasted like your Wednesday night diner special. I think this would be a sauce that could be made in a slow cooker, which makes me like it even better. This is a relatively quick spaghetti and meatballs dish that could easily be doubled for leftovers. My family gobbled this dish up and it was a huge hit! If making again, I would omit the oats and add bread crumbs as I did not care for the texture of the oats in the meatballs. Calling all meatball lovers! 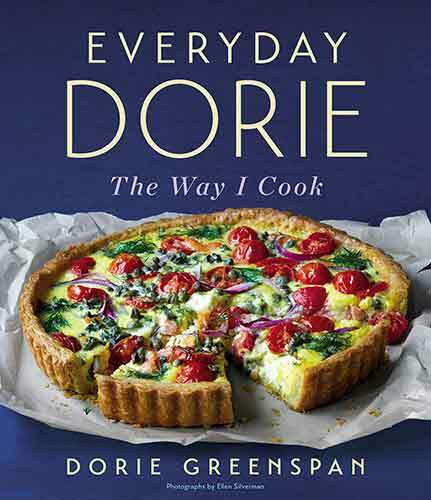 (And Dorie Greenspan lovers!) This simple meatball recipe is easy to put together and is quite unique in its ingredients. The sauce is simply made from quality San Marzano tomatoes, olive oil, garlic, a touch of sugar, and the addition of a surprise ingredient: balsamic vinegar. The rich acidic flavor really adds a “pop” of flavor to the easy-to-make sauce and the sauce portion of this recipe would be great with a number of your favorite Italian recipes you already have on hand. If you’re like me and love to hide good-for-you ingredients in dishes, both chopped walnuts and oats fill these beef and Italian sausage meatballs; both add to the meatballs texture and deliciousness. This recipe was a huge hit at our latest dinner party; it was fun having our dinner guests guess what the secret ingredients in the meatballs were! I highly recommend this unique version of a classic. Perfect, Anna. Thank you for taking the time to let us know how much you and your guests love these!